The timeless fragrance L'Air du tempsby Nina Ricci that brought a fame to the Ricci house became and remains until today one of the greatest fragrance creations. L'Air du Temps was created due to the great passion of the Nina Ricci's son Robert for fragrances and the art of the master perfumer Francis Fabron. 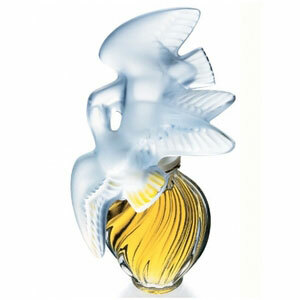 The fragrance was launched after the World War II, in 1948, and the dove on the top is a symbol of peace. The floral-spicy note of the carnation is in centre of its composition. Bergamot and rosewood support the development of the carnation theme, refined with the notes of rose and jasmine. Violet and iris give a powdery nuance, and create a harmony with the woodsy notes of cedar and sandal, while sensual musk and amber add the final feminine accord to the composition.